Below are all of the questions we could remember having been asked in the past. If you have a question that's not on here, please feel free to email thesupertonesr@alivenetwork.com or call Gemma on 0845 226 3116. Having played venues of various shapes and sizes, we are pretty adept at making the most of the available space. However, a minimum of 3x3m is required for an optimum setup. Clients have the option of 2 x 60 min sets or 3 x 40 min sets. Your choice will depend largely on the nature of your paticular event and the associated schedule. We generally find that 2 x 60 min sets is the most popular choice and from experience, this seems to offer the greatest flexibility on the night, should timings not run 100% on schedule. Whichever option you choose, we are more than happy to adapt set timings as the night dictates. 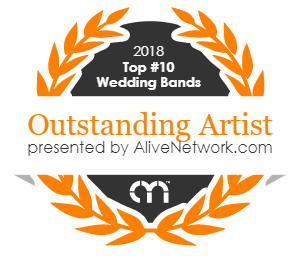 Clients are welcome to select songs from our repertoire which they do, or do not want included in our set, however it should be noted that we do not use set lists. The absence of a set list means that we have the freedom to select the most suitable songs as the night unfolds and ensures a unique experience for your guests. Although based in Surrey, The Supertones are available for bookings nationwide. The majority of our shows are private functions/weddings, however we do also play a handful of showcase gigs during the year, details of which can be found on our facebook page here: www.facebook.com/Supertonesband. If there is a particular song which you would like us to play, but is not part of our repertoire, this can be arranged for a nominal fee. Please note that whilst we enjoy the challenge of learning new tracks, not all songs will lend themselves to our particular instrumentation. In the event that a request contains instrumentation which we are unable to reproduce live, adaptations to the arrangement may be necessary and in some rare instances your request may simply not be possible. All requests should be made at the time of booking in order to allow ample rehearsal time and to assess suitability. We understand that it may not be possible for all clients to observe a live performance prior to booking and for this reason, the integrity of our demos, audio and video is paramount. Please be assured that all associated media is an accurate representation of the bands live performance. A complimentary DJ service is offered as standard on all bookings made within 7 days of enquiry. We offer a comprehesive playlist which encompasses a wide range of modern chart hits as well as classic floor fillers. Any advance requests relating to preferred genres or specific bands etc are welcome providing that we own the music in question. We are unfortuntely unable to purchase music on request due to the potential costs incurred, however clients are more than welcome to provide the band with playlists contained on ipods, mp3 players etc, which can be played through our system. Clients are welcome to use our wireless microphone and PA system for speeches. Please note, standard arrival and set up times will apply unless early arrival has been purchased. Our standard booking rate is based on 2 hours of live music with dj service between sets. The live performance may consist of 2 x 60 minute sets or 3 x 40 minute sets. Additional sets may be purchased for a nominal fee and we are able to cater for up to 3 hours of live music, based on our current repertoire. We usually aim to get our first set underway around 8.30pm and finish our last set around 11.30pm, with a further 30mins of mp3's to round the night off. We find this enables us to bring the energy down through careful song selection in a controlled way and avoid an abrupt end to the night. If you require early arrival or late finish outside of the standard booking timings, this can also be arranged for a nominal fee. See our What We Do page for a full run down of the events events. We take a great deal of pride in achieving a clear, well balanced sound for our live performances as it is something we feel particularly sets us apart from our competition. That being said, we also appreciate that timings can be very fluid on the day, with events often running ahead/behind schedule. With this in mind we will always endeavour to achieve the optimum sound possible within the available time. As a general guide we require an hour to set up the equipment and sound check (Please note, this does not include time taken to load in). In the interest of fairness and due to demand, we operate on a first come first serve basis. If your preferred date is currently available you may secure it with a deposit payable to Alive Network. Our commitment to our chosen profession and to our clients is our number one priortiy. In the highly unlikely event of the band splitting up before your event, please rest assured that every effort would be made to provide a suitable alternative. As a busy working covers band our equipment is our livelihood and we are therefore understandably keen to avoid any damage caused by inexperience, intoxication, misuse etc. We are more than happy to accommodate guest singers/musicians subject to prior arrangement and approval. Any requests made on the night will be at the bands discretion, however we ask that clients/guests refrain from making such requests as refusal may cause offense. Our typical stage attire is smart casual, consisting of dark trousers and shirts (no ties), however if your particular event requires a more or less casual dress code, we are more than happy to accommodate as required. We always carry up to date PAT and PLI certification which are renewed anually. Why should I book The Supertones? In such a competetive profession the real question is, what sets us apart from our contemporaries? The answer, we believe, lies in our commitment to treat each and every audience as unique, and nowhere is this better exemplified than in our decision to abandon set lists. The use of set lists assumes that every audience will react the same way, to the same songs, played in the same order. In our experience however, this is simply not the case and a more flexible approach is required. We consider it a personal challenge and responsibility to keep as much of the audience engaged for the duration of the night, and being able to match our song choices to the ebb and flow of YOUR night is crucial in achieving this. So if you are looking for a Surrey function band who avoid the typical “wedding band” cliches in favour of a more contemporary edge, and who are totally commited to the enjoyment of you and your guests, The Supertones are the perfect choice for your event. Standard booking charges start at £1,100.00, however prices will vary depending on the time of year and the location of your event, as well as any additional extras such as early arrival, late finish etc. Feedback from former clients is arguably the most important/useful information when considering a booking. Please feel free to read through some previous client testimonials here. Do The Supertones have any specific requirements? We require something to eat and drink and where possible we ask that a room be provided where we can change into our stage attire. Assuming there is adequate space for a 4 piece band (as previously outlined), we are happy to consider any venue. As an experienced wedding/functions/corporate events band, we have encountered venues of every size and shape over the years and actually enjoy the challenge of achieving the best possible sound at each new venue. Please be advised, as a general rule we prefer not to perform at venues with sound limiters, as we feel that the restrictions are often unreasonable and in extreme cases can defeat the purpose of having a live band. Such venues will be considered on an individual basis and we ask that clients provide this information at the time of booking. The ability to produce a balanced and polished sound at venue appropriate levels is of paramount importance, and something which we consider to be one of our greatest strengths. It is common practice amongst some bands to use amplifiers which need to be played at minimum volumes in order to achieve their desired tones. Whilst this method can produce favourable results in the right size venue, it does not offer much versatility at different volumes and many bands are either unable or unwilling to adapt their levels specifically to each venue. We believe that our choice of equipment and method of set up gives us the greatest possible flexibilty without any compromise on sound quality. In addition to the above, we make a point of sound checking each venue from scratch with no preset levels. This allows us to achieve the optimum sound at the appropriate levels specific to the size and acoustic properties of your particular venue. We always carry adequate extensions and plug boards for most situations, however we do ask for a minimum of 2 x 220v outlets as close to the stage area as possible, as running multiple devices from a single outlet will result in audio interference. All of our equipment has been PAT tested as required and all plug boards contain surge protectors as an extra precaution against overloading. Do The Supertones offer any additional services? We offer a number of additional services, including Early arrival, late finish and dancefloor lighting and PA upgrades. Please refer to booking options for details.